One of our larger ladies leapt at the chance to review this skirt, saying that she had been on the lookout for smart clothing made from comfortable fabrics as she found that more tailored clothing with stiff waistbands with zip and button closes tended to cut into her after a few hours, making the last part of the working day and the commute home a trial and literal pain for her. 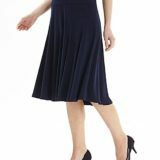 She requested a size 18 skirt, in navy. (Other colours include cobalt – a deep vibrant blue – and black.) It arrived promptly, well packaged with some advertising materials added to the package. She wore the skirt for a full work day, machine washed and tumble dried it – following the care instructions on the label – and wore it again, for another full day. She loved the way the skirt felt, with the flaring kick pleats adding a satisfyingly feminine fillip to the supremely comfortable design. She found she could wear the skirt all day without it cutting in, even after a biggish lunch that caused her to bloat a little bit. The fabric is sturdy and durable, feeling great against the skin. The fabric is perfectly balanced, swirling enticingly with every step and turn and yet falling in attractively sculpted folds when she sat still. She is so enamoured with the skirt that is planning on purchasing a black one to go with the navy! At first glance, the skirt is plain and ‘ordinary’, seeming to be just another unexciting skirt. It is only when the skirt is put on that the tactile pleasure of the cut and the fabric becomes apparent. It is great as office wear when a more uniform appearance is needed. The skirt fits well, making our tester feel slim as well as looking good. The godets swing out attractively, giving a wide range of motion even when running or climbing step-ladders. Of all its features, comfort is this skirts strongest benefit. 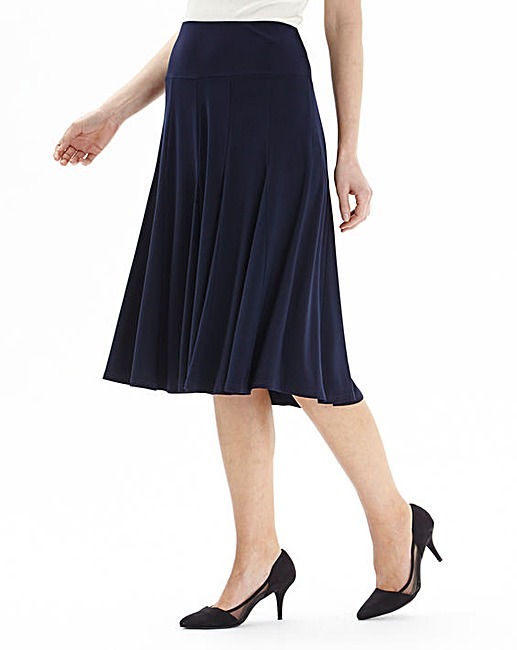 At £28.50 this skirt is not horrifically expensive, nor is it delightfully cheap. However, the quality is good and the skirt will last a long time with regular wear, making the price a very reasonable one. As stated above, this skirt is well-worth the money and our tester would even be prepared to pay a little more for it, given the excellent quality and comfort that it offers.